Time Warner updated firmware on router and it didn't come back up as planned. Was rectified after a hard power reboot when I returned home from a break. Previous outage a week ago was UPS batteries were expired and when UPS came back up the self test wouldn't complete due to this problem. Batteries were replaced with new ones and server was brought back up without incident. Thanks guys and gals and happy holidays and new year! Thanks for the feedback as I never can be sure if it is something in my jury rigged home built system or a problem that is elsewhere. If I ever ask my ISP, they always say that it is entirely my fault, but, and you might find this hard to believe, in the past, it has always ultimately proved to be something wrong at their end. At least the firmware update didn't brick the hardware, but, if there were a chance that it would take a server down, perhaps the ISP should have given you some options. But, the free ice cream is back, and, I am not complaining. I have muich bigger concerns, such as the fact that a new GT350R is beyond my means. Tetge wrote: I have muich bigger concerns, such as the fact that a new GT350R is beyond my means. But you, insert pejorative descriptive term for you here, managed to hang onto your SVT Cobra, so, you still have a 500+, crank shaft HP, Mustang. It might not handle or stop as well as the new GT350, but, who cares about stopping or handling, anyway? Odds are that it will hold its own in any drag race, and, that's all that matters. Plus, as good as the flat plane million RPM red line V-8 sounds, the SVT Cobra is no slouch when it comes to making wonderful sounds in the car, and, outside of the car. So, you can post sad faces, but, you still have something very special to drive, should the urge strike you. I feel zero pity for you, when I compare your situation to my deprived state, in which I am consigned to driving an auto trans grocery getter that is so gutless that it gets about 50% better gas mileage than my old Cobra ever managed. And, do not even bother to post that your Cobra still gets 26 mpg on the highway, because it wouldn't if it were my foot on the throttle. Thanks for the update, Tim. I have been so busy that I didn't notice. Thanks again for providing and supporting the site. I have no where else to vent. I heard a new Boss 429, when they first were available, start up in a bay at Sunrise Ford, and the car rocked on its suspension when they revved the engine from idle. It was a very mean sounding exhaust note that spoke of serious cubes and HP. But, it too was priced well beyond my means. As I thought about your response, it came to me that the only high performance Fords that I ever could actually afford were the SVT products that I owned. But, then, I figured that the Shelby GT350's were never intended by Ford to be an everyman's vehicle, so they priced them at semi bargain prices for what they delivered in performance and they figured that there would be sufficient elderly (relatively) buyers in the vast Mustang fan boy audience so that they could sell all that they wished. They were not the least bit concerned that the common working man, or elderly poor person, could never have a high performance Mustang that was reputed to offer world class handling. I can't blame Ford, as business is business and they are pretty good at making money on their products. Perhaps in a few years some of the good handling parts will trickle down to the regular 5.0 Mustang, as I expect that the high tech V-8 of the GT 350 will never be obtainable by me. Reports that I have read all say that the 2015 and up 5.0, even with the Ford Performance Package, is sort of floaty and unsettled and the front end pushes when it is pushed hard. 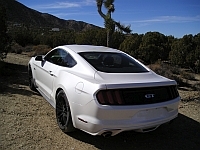 It rides well in normal use and is no doubt fine for almost all the driving that a person would do with a daily driver, so it is a nice car, but, a bit soft, and also, due to its portly curb weight it is actually slower than the previous 5.0. And, at $35400 MSPR for the base, no frills, 5.0, with only the performance pack as an option, it list for more than the loaded SVT Cobra did. Lot of money for a soft car that is going to get curb stomped by the new Craparo SS.